One cannot help but think about remote islands and lost treasure when viewing the Tribal Pirate Skeleton Dagger. 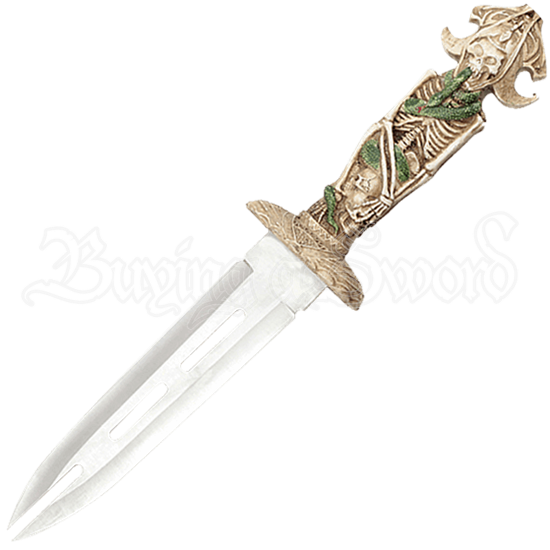 Just think of all the adventures that await the buccaneer who chooses this blade as companion when sailing the Seven Seas. The detail found on the polyresin handle and sheath impresses the eye. A ship wheel and crossed daggers are among the intriguing features of the sheath while a skeleton with tribal headpiece forms the handle. Tribal patterns and foliage highlight the skeleton and skull found throughout. Green snakes slither about the deceased pirates, adding a touch of contrast to the skeletal motif.